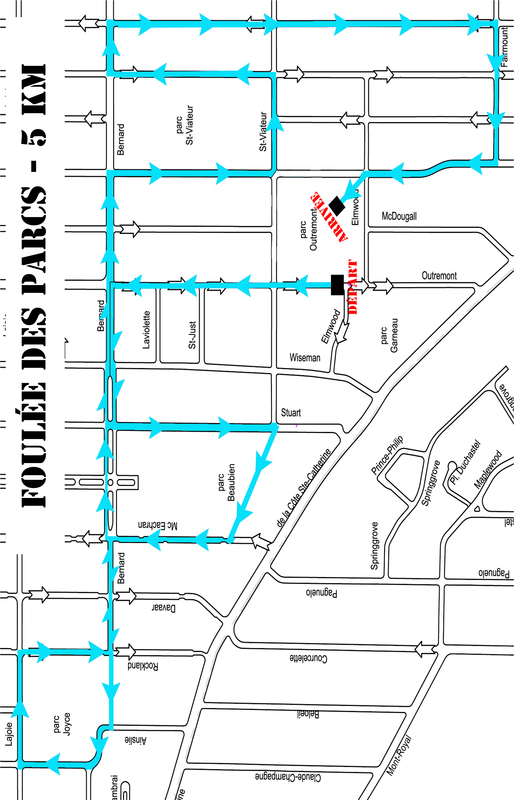 All race starts of Foulée des Parcs take place on Outremont Street between Elmwood and St-Viateur (except the Family-and-Friends-Challenge). 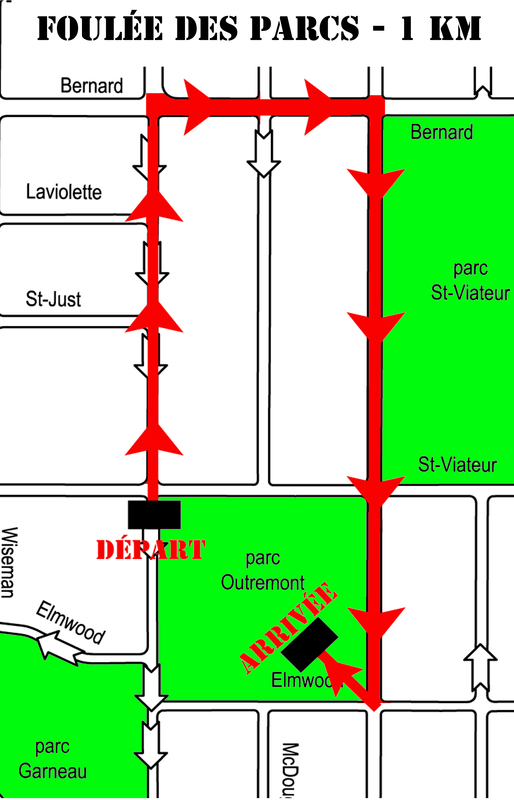 Check out the interactive map to go from the Outremont metro to Parc Outremont. All finishes are at Parc Outremont. 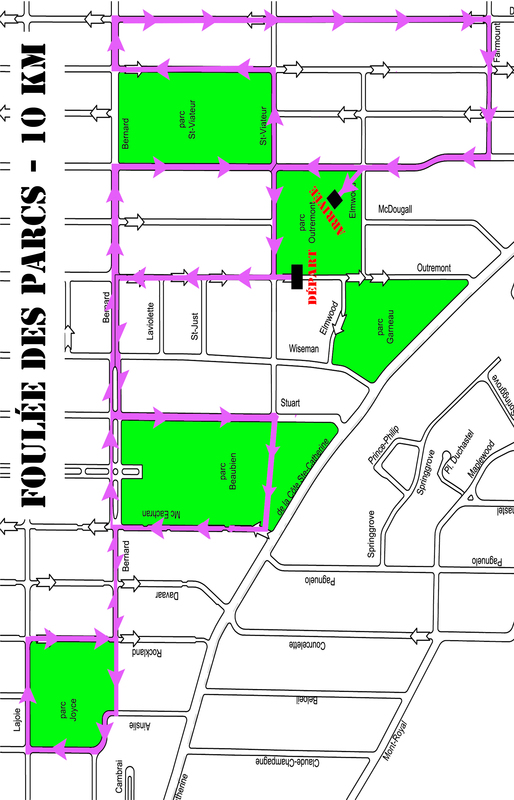 It is strongly recommended to arrive at Parc Outremont at least half an hour before the scheduled start of your race. 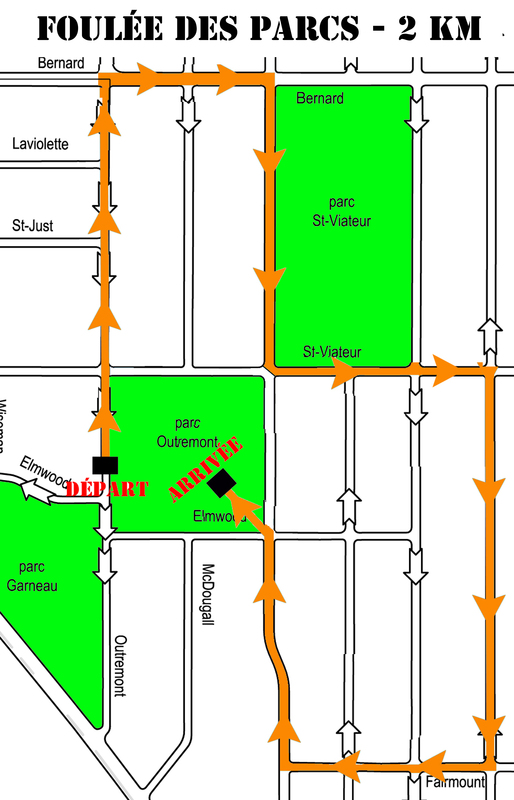 Each runner must be at the start line located on Outremont Street, between Elmwood and St-Viateur Streets, at least 10 minutes before the official start time. Each runner will receive an official t-shirt and promotional offers from some of our sponsors. In addition, a snack and water will be offered after the race. There will be surprise prizes drawn on the day of the event. And finally a medal for ALL children 12 and under! There will be 8 races, something for everyone! It is the longest race of the event, which will please seasoned runners as it includes two gorgeous climbs on Bernard Street and exploration of the 4 most beautiful parks in the borough. It is actually a double loop of 5km. Free of traffic, you will travel some of the most beautiful streets of the district. The water points will be at kilometre 3 and kilometre 8 and to the finish. Participants must be at least 12 years of age in 2016. Click here to print the course. If the 10 km seems a little long for your fitness or training, the 5 km will be for you. A race accessible to all with a beautiful climb on Bernard and exploration of the 4 most beautiful parks of the borough. There will be one water point at kilometre 3. Click here to print the itinerary. This race should bring together young and old as well as runners with strollers. The course is virtually level and the distance is accessible to everyone. You can all run or walk this distance. Participants include the uninitiated, untrained (subject of course to special medical conditions), and those wanting to try the experience of a race organized in the unique atmosphere of such an event. Click here to print the course. This is the race for your little ones because you must be under 12 years old to participate. A safety team is present throughout the course which allows them to run all the way solo. Although it is possible for you to accompany them directly on the course by registering (race 3 to 7 years only), the journey is designed so that you can follow them and encourage them easily along the road. Click here to print the course. A new addition this year! This follows the same course as the other 1km races. This year, the Seniors Walk “Dare to Act” is a new addition. It is one of the activities organized by the City of Montreal Police Department and its partners as part of the activities surrounding the World Elder Abuse Awareness Day on June 15th. Bringing together seniors from Outremont and the Northern Montreal region, this 1 km walk brings together every member of the family of the Foulée des Parcs. A beautiful family challenge to bond and have fun together: organize your team for this multi-age relay race! Participants must be at least 7 years of age. Course map coming soon!